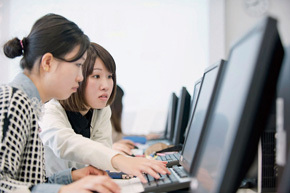 Students in this course will be able to acquire a practical English ability as a tool for obtaining global information. The two classes offered are: Advanced English and General English where students can learn depending on their English levels. In addition to this, they study a broad range of knowledge and practical business skills in order to be active in the international community. 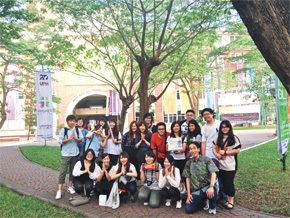 This course provides an experience-oriented program focused on overseas fieldwork mainly in Korea and Indonesia. Chinese intensive course allows students to choose Chinese as their first foreign language. There is an exchange program with Northwest University in China in order to be active on a global scale. Students are expected to be experts with broad views and practical skills based on the business fields through the systematic information and business management curriculum. In the class, students run virtual-companies in order to acquire social adaptation abilities so that they can respond to the needs of the age quickly and be active in their business fields. Students can learn interdisciplinary subjects depending on their interests such as psychology, culture, communication, history, literature, religious, and pedagogy. Psychology and Communication Skills classes provide students with the ability to think and express their own thoughts. 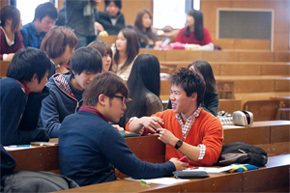 The demand of teachers who can deal with educational issues at local schools with foreign students has been increasing. In order to adopt to this internationalization and diversification at local areas, this course has unique curriculums. 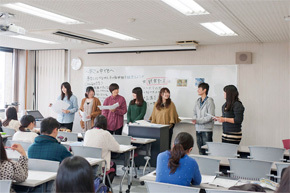 Affiliated with local elementary schools, this course has prepared programs where students support English classes and learn on-the-job training so that they have many practical opportunities. To pass the teacher certificate exam, this course has fully assists students with a career-supported center.